Spring is a time for reevaluation and renewal. It’s natural, as people shed their heavy winter clothes and anticipate more revealing summer wardrobes, for their minds to turn to cosmetic procedures. What better time to ask-what are the top trends in 2015 in the world of beautifying treatments? Find out in our fascinating review below, in Topics in Cosmetic Medicine. As always, we’ve been busy bees at MCSC. In addition to several educational meetings for our staff, Dr. Schiffer also attended an update on Botox® in treatment of Migraines. Our most exciting piece of news is that Stacey Brennan, a celebrity beauty blogger in Toronto, visited the clinic, and has posted an amazing blog about her experience with Dr. Weinberg. Have a look https://www.youtube.com/watch?v=m9RbenXSJqc. Finally, if you haven’t been on our Facebook page recently, you should definitely visit- we’re running another fun program for Mother’s Day, and you and your mom could win a great day of pampering, so don’t miss out! This month we’re offering another excellent way to get your skin summer ready, with a fabulous AFA peel. AFA exfoliates and reconditions all skin types, with no UV sensitivity. Also on offer, treat yourself to a fabulous lip enhancement. 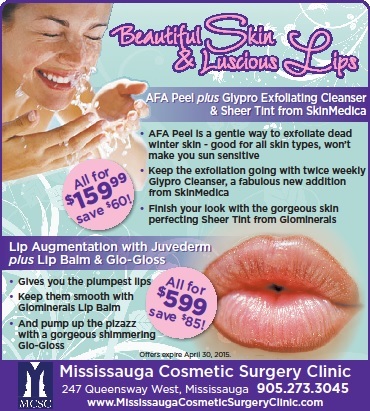 Our sale includes Injectable Lip augmentation together with our best lip products, all for a great price. In addition, Latisse® rebates are back! If you’ve always wanted to try this eyelash growing potion, or if you’re in need of a refill, don’t wait, now’s the time. Save $25 while rebates last!